Check Out Our Executive Summary on the Breast Cancer Virus! Dr. Kathleen T. Ruddy, Founder of the Breast Health and Healing Foundation and breast cancer surgeon, has released her executive summary that covers her soon-to-be-published book “Of Mice And Women: Unraveling the Mystery of the Breast Cancer Virus.” The book will be published in June 2015 and you can access the executive summary through the Breast Health and Healing website by clicking here. Please be sure to download the executive summary (which is completely free) and share it through all of your social networks! Let your friends and family know about this important book. Dr. Kathleen Ruddy has spent eight years writing and revising this book and is now in the final process of publishing the book in both paper and electronic formats. And the best part – the published, digital book will be completely free to the public! Research on the breast cancer virus is vital in our search for methods to prevent this disease. A large part of human breast cancers, as much as 40 percent, have gene sequences similar to a retrovirus that causes breast cancer in mice. This retrovirus is called the mouse mammary tumor virus and the researchers Drs. Pogo, Etkind, and Melena have played a key role in advancing the study of the Pink Virus. If cancer researchers can determine that a virus causes as much as 40 percent of human breast cancers, the scientific community can work on developing a vaccine to prevent this disease in men and women across the globe. This would be a tremendous gain toward our goal of preventing breast cancer. It is time to once and for all determine whether the human mammary tumor virus causes breast cancer in women and work toward developing vaccines that can prevent the disease. 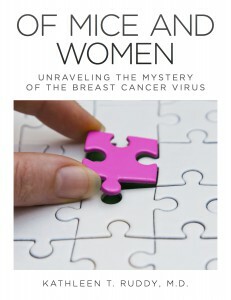 All donations that we gather from the release of the executive summary and the book will be used to fund the full-length documentary film, “A Pox On Us,” co-produced with Soap Box Media, whose profits from sale and distribution will be used to directly fund research on the breast cancer virus. We want this executive summary and the upcoming book to spread like wildfire through the breast cancer community, but we need your help! Please share it on Facebook. Share it on Twitter. Share it on Google+. Share it on LinkedIn. Let your networks know about this revolutionizing work!